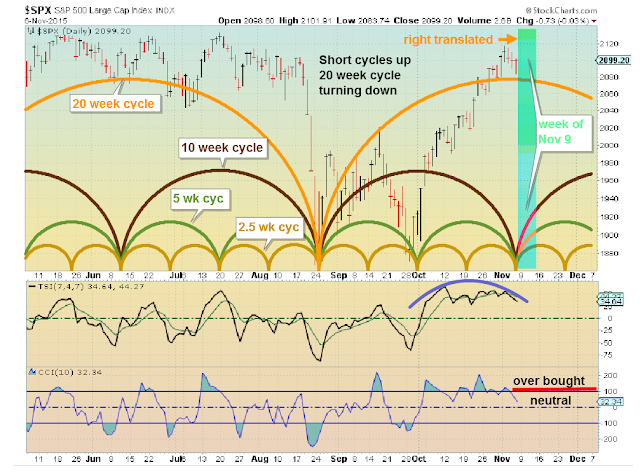 As expected the longer cycle is becoming right translated as it ended higher for the week as the half cycle was passed. 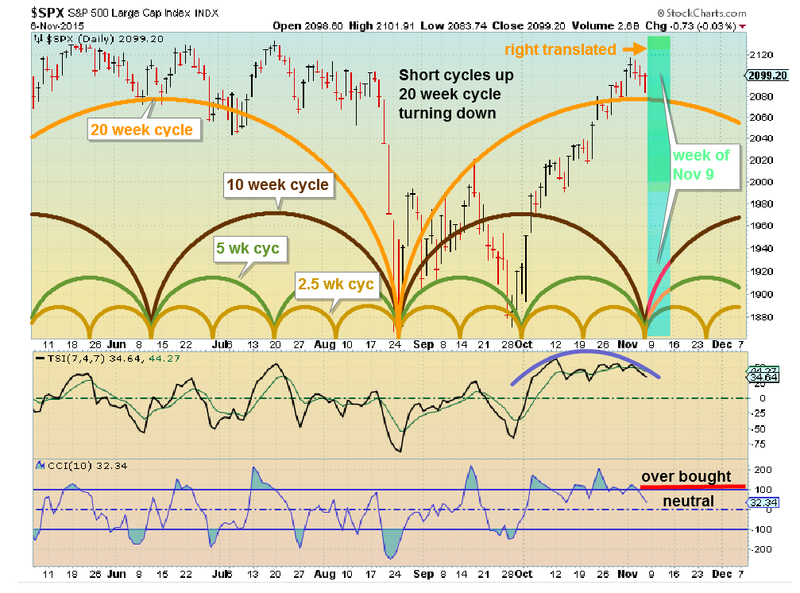 With shorter cycles still up the longer cycle will probably become even further right translated. New index highs seem to be in the cards before we get shorter cycles turning down and with the longer cycle providing enough down side pressure to alter the direction of the market. TSI turned bearish, CCI also trending down. A move higher is now in doubt with Monday's drop. On Nov 5 I posted about the end of 2 longer cycles (Kitchin and Juglar) that should show some strong downside over the next 3-6 months into the first quarter of 2016. This may explain this week's action (as retailers like Macy and Nordstom project less than stellar earnings going forward. Guess those 2-3 part time jobs don't allow shopping at upscale retailers? I think the forecast was a miss last week....let's move on to next week. True, it happens and as I state in my general comments for my blog at times I will be wrong... Hopefully I have made proper adjustments to properly interpret the data for the upcoming week (I noted I was making adjustments). no one expects perfection...they just hope for it :) as you state, your cycles are just one of multiple data points to make decisions on...i find your cycles interesting but has not been tradeable for me yet but I still appreciate the service. thanks.